Now that our historic event is over, let me say a few words. I am sure others would want to write a summarized version. On behalf of the DC folks, I really thank those who come from various parts of the world in honor of our invitation believing such important gathering to celebrate 1st anniversary for Axum Alumni Association (AAA) will make a difference. They really made us proud and gave meanings to our get-together party. The time and money spent to fulfill this purpose was already too much. Yet, they were determined and convinced us, the locals (Washingtonians) that a real change can only come through decisive action. Such determination did keep our spirit very high. I also want to thank DC folks specially, Mr. Zemichael Tadesse (Michael), Ms. Leya Berhane, Efrem Sahle (Student), Samson Kahsay (Student), Ms. Shushay Kesate, Mr. Mulugeta Berhe, Mr. Fikre Berhane/His wife Ms. Abeba Abegaz, Ms. Azeb Zegeye and Ms Denkinesh Hantal for round the clock dedication and others who helped in variety of ways to make our event successful. And of course, thanks to Denver folks who had the guts to initiate our association. 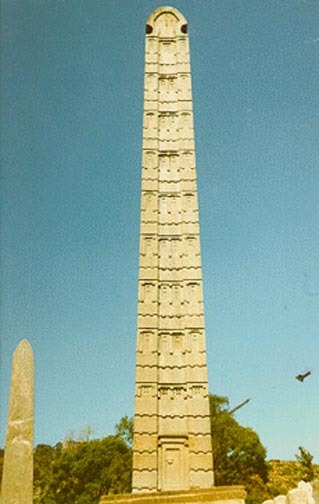 Collectively, we made our country, especially Axum proud. The three day activities consisted of meetings (board of directors and general assembly), entertainment/fundraising/cultural show and reunion picnic. On Friday evening, we invited the board of directors for dinner at a private hall. After the delicious dinner and a little chat, the board spent that rest of evening (till 11:00 PM) discussing issues pertaining to the year long activities, accomplishments, project proposals, crafting Saturday meeting agenda and other minor issues regarding the festival. Saturday meeting at Howard Universty was very touching and highly spirited. Axumite’s from all part of the country, Canada and Europe came prepared and ready to fulfill the dream of their brothers and sisters back home-To discuss a strategy of expediting the proposed laboratory project. Hours were spent discussing and exchanging ideas. Before the meeting was adjourned, members reached an agreement to pledge/contribute no less than $1000.00 towards financing a project costing $2.5 million. More than half of the total fund raised was from this meeting. DC folks really worked hard to make this important evening one of the best Alumni events ever to happen in the Washington DC. The event started late but around 10:00 PM, people were just coming in volumes until all seats were taken. More chairs were brought in but the place was fully packed. The event began with a welcoming speech and introduction from W/o Etienesh Berhane and I. Mr. Haile Nebabi, chairman of AAA followed by our special guest, Dr. Tsehaye both gave a brief history and objectives of the association. Dr. Tsehaye’s message was direct and powerful. He gave advice of the benefits of working collectively and encouraged us to overcome challenges. Other impressive presentation to spice up our evening was a poem written by Mr. Embaye Yehdego, a father of two wonderful children who lives in Maplewood, Minnesota. This poem was an awakening experience to the rest of the audience in understanding the real cause of our gathering and reminded us to do more and address the endless needs of our people. That poem was so powerful that a lot of people requested to have it posted on a website (Will be posted soon). The auctioning portion of the program was very successful and entertaining. Proudly so, Mr. Kahsay Teferi demonstrated his theatrical talent and personality to generate $2100.00 from that single item. Our beloved artists Berhane Haile, Fikre Seboka, Embiza, Abebe, Berhane Kidane, Tesfatsion, Kedir and Fitsum too have done their best to keep the audience dancing all night long. The chemistry amongst them worked out to be terrific. On one occasion, the entire audience got wild when Berhane start naming names of neighborhoods and his fans. Even the extra hour beyond the permitted time could not slow anyone at all. We left the hall around 4: 00 AM in the morning. It was a memorable event indeed. The next day was Sunday, a day of our reunion, a time to relax and enjoy the summer of Washington D.C... The intended picnic area (The Haines Point) was selectively picked and reserved to reward our guests. However, there was change of location and were given a similar picnic area right next to the Potomac River and between Lincoln and FDR memorial. We spent that beautiful day enjoying Zemichael’s barbeque to go with specialty Mase (Tej). The rest of that afternoon, some of us were doing the accounting, playing soccer and others were just retelling the comedies of MEHREY WELIHANUS. What a day. We stayed there enjoying the unseasonably humidity free Washington till 9:00 PM. The enjoyment did not end there. Everyone at the picnic decided to join the mesenabeti party at Axum restaurant. Our beloved artists, Berhane Haile, Fikre Seboka, Tesfatsion and Kedir played all night long to conclude such historic event with unforgettable memories. Here, I really want to thank Mr. Tetemke Temesgen from Dallas, Texas who was instrumental in generating the additional $1170 from admission tickets alone. I am very proud to get to know such personalities. Do you know how successful our event was? Very successful indeed-Considering our resources, we managed to raise $70K+/- (Confirmed figure to be posted soon). Personally, what’s more important was that everyone had a good time and we all spent that weekend as one large family. That was a dream come-true. Those who missed this occasion surely missed a lot. Hope to see them next year to fulfill our project and make our 2nd anniversary in Seattle a headline for weeks. Congratulations!!!!!!!. On behalf of AAA-DC festival organizing committee.